House the ES-6 in a Eurorack case of your choosing. The power connector is Doepfer standard. 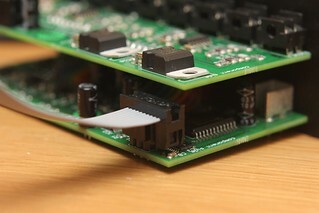 If using the power cable supplied with the ES-6, the connector is keyed and will only insert into the ES-6 the correct way round, in which case the red edge of the cable is nearest the edge of the PCB, and carries -12V. ("-12V" is marked on the PCB itself next to this end of the connector.) Be sure to connect the other end of the power cable correctly, again so -12V corresponds to the red stripe on the cable. ES-3 mk3 - connection is via the supplied 10-way cable to the header on the ES-3 mk3 PCB (see image below). ES-3 mk2 - connection is via the supplied 10-way cable to the header on the ES-3 mk2 PCB (see image below). 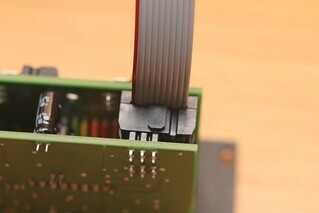 You may find it helpful to loosen the screws that attach the PCB to the module's panel while fitting the cable. Note that the six conductors on the side of the cable with the red stripe engage with the 6-way header on the ES-3; the four unused conductors hang over the small IC at the edge of the board. ES-3 mk1 - requires an equivalent connection to be soldered to the ES-3 PCB. Details to follow. 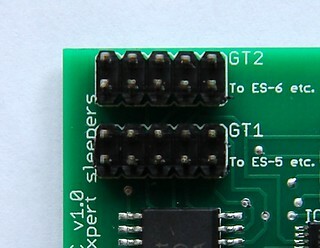 The ES-6 has a connector for expansion modules such as the ES-7 CV Input Expander. Please turn the power off before connecting or disconnecting the expansion modules.